Whatever it is, it was inside the Sphere. Now it's out, free to act. Author Andrea Codrington discusses the opening titles for Sphere, from her 2003 book Kyle Cooper: Monographics. 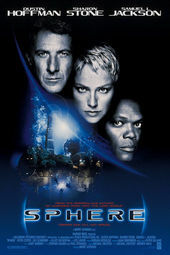 When ﬁrst approached to create main titles for Barry Levinson's Sphere, one thing was clear to Cooper: “We have to have ﬁsh with teeth — evil ﬁsh.” After creating idea boards containing old engravings and line drawings of sea creatures with sharp-toothed maws and shooting them through glass for a watery effect, Cooper and colleague Mikon van Gastel had the idea of actually spherizing the type itself. The result is another hallucinatory paean to the horror and suspense genre that so inﬂuenced Cooper when he was an adolescent. Sceptical of the use of high technology in the service of main titles, Cooper admits that the contrast of the slick, spherized type with hoary images of sea-monster lore provides an appropriate metaphor for the story, which in a fusion of past, present and future concerns an ancient sphere resting on the bottom of the sea that comes from the future. Andrea Codrington is a Brooklyn-based editor and writer specializing in design and visual culture. She is the co-author of Pause: 59 Minutes of Motion Graphics and sole author of Kyle Cooper: Monographics and has written extensively for such publications as The New York Times, The Washington Post, Harper’s Bazaar, Elle, Metropolitan Home, Metropolis and Cabinet.